New Delhi: Today, the National Movement for Old Pension Scheme (NMOPS) president, Vijay Kumar Bandhu was called out by the union government to discuss the issue faced by government employees of state and centre. Vijay Kumar Bandhu, told Ten News that today he had a talk with several ministers of the ruling government who promised to solve the issues, the ministers said to him that the matter will discussed with the Prime Minister. 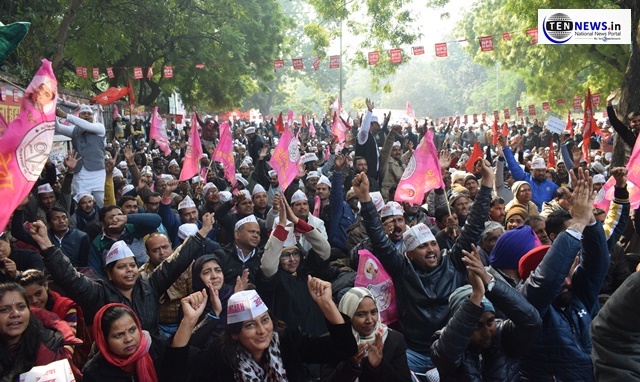 On January 28, the NMOPS began their protest in Delhi, in which thousands of government employees demonstrated against the ruling government which was still staged on the fifth consecutive day. The protesters used slogans such as “NPS GO BACK, OPS COME BACK” to grab the attention of the central government. The protestors claimed that if a person is elected as a corporator, lawmaker or parliamentarian, they are eligible for pension even if that person has assumed office only for a day. The massive protest was joined by several organisations including Indian Railways Employees Federation (IREF) and National Movement for Old Pension Scheme (NMOPS). NMOPS is a non-profit organisation to exchange views, ideas and information in order to restoration of Old Pension Scheme, which was changed by central government since January 1, 2004. # The old pension scheme has Government Provident Fund (GPF). # Prescribed deduction of 8.33%. # GPF can be withdrawn any number of times. # On retirement, the whole amount is given to the employee without levelling any taxes. # On the death of employee, pension is guaranteed. # Full amount of GPF is under the control of government.